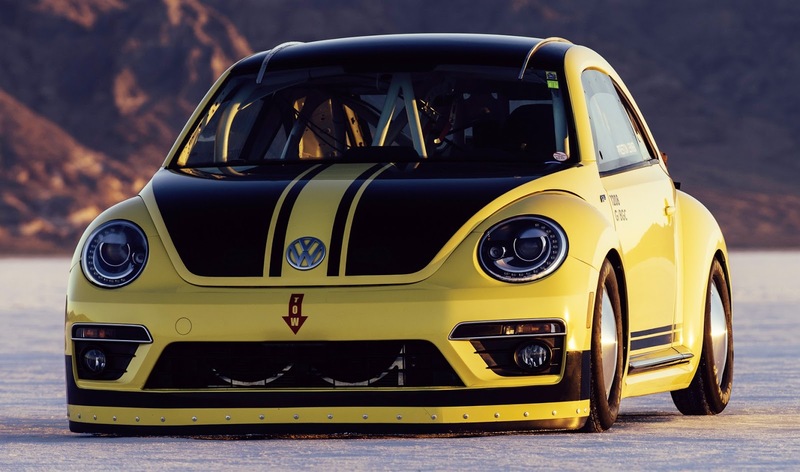 A specially-tuned Volkswagen Beetle has set a new speed record powered by a turbocharged 2-litre gasoline engine giving 550 PS. The Beetle set the new record at the World of Speed event at Lake Bonneville in Utah (USA). The Beetle LSR (Land Speed Record) achieved the fastest speed ever documented for a Beetle, reaching 328.195 km/h (205.122 mile/h) over a measured mile. To achieve speeds of over 300 km/h many aspects of the Beetle LSR were reworked, and the car was modified to conform to regulations for record drives on salt flats. The 2-litre TSI was boosted to a peak power of 550 PS (by changes that included a new turbocharger, different pistons, camshafts, connecting rods and cylinder head modifications). The engine achieved a peak torque of 571 Nm. Equipped with special wheels and tyres for driving on salt, and a much lowered body, the Beetle also had a limited-slip differential to improve traction, while a safety package provided the necessary protection. This comprised a rollover protection cage, a race seat with five-point harness and a fire extinguishing system. In addition, the record-setting car had two brake parachutes. Meanwhile, one former Volkswagen employee is no doubt hoping to climb to new heights within Nissan Europe. Alex Smith has just been named managing director of Nissan Motor (GB) Ltd.
Smith, previously director, Volkswagen UK, takes over from James Wright, now vice president of Nissan Europe East, overseeing Russia, Ukraine, Central Eastern Europe (Poland, Hungary, Czech Republic and Slovakia),and the Datsun Business Unit in Russia. Smith and Wright report to Guillaume Cartier, senior vice president for sales and marketing in Nissan Europe. Before joining Volkswagen UK in 2007, where he led group parts sales, commercial vehicles and later passenger cars, Smith worked at Kia Motors, GM Daewoo and Ford of Britain.